It is running ! And well! K100-forum.com » General discussion » It is running ! And well! 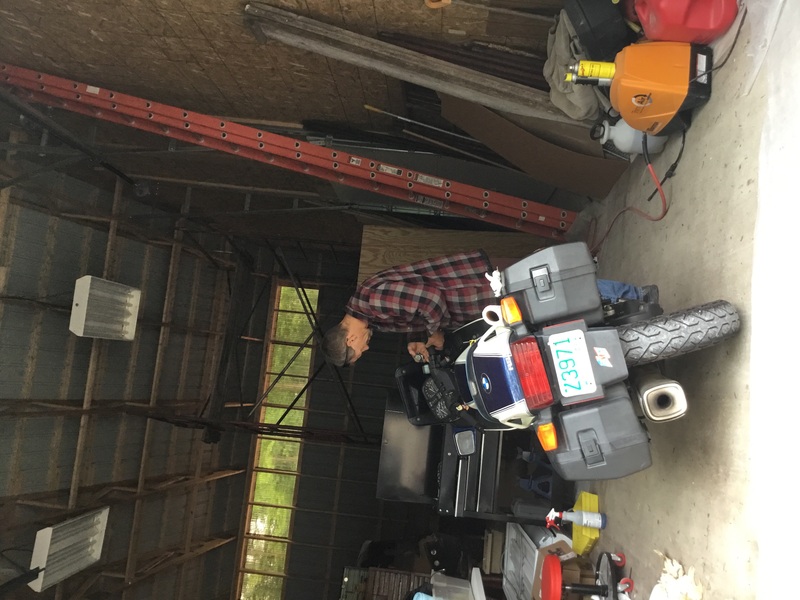 I wanted to update all those that helped us this past weekend getting g our new to us 89 k100 Rs se running. The first test run I took it on stalled out about 1.5 miles from home. Loaded it up on the trailer and Dave found one of the connections from the fuel pump corroded apart. After that I was a bit hesitant to try again seeing I’m home alone. So I chanced it and drove to Dave’s work about 3 - 4 miles away. It ran great! Several things we need to tweet. Abs/ Trangle light is on, throttle is sticky, and there’s a slight rattling when shifting which sounds like the exhaust rattling. We still need to go through the splines and other things more carefully, but thrilled it starts right up and is a dream to ride! Thank you all for your help!pleae let me know if my pic is not right side up. The more you run it, the better it will run. The ABS has a fault code readout that can tell you where to look. The rattle could be the stands against the muffler. Sticky throttle, loosen the right grip assembly clamp on the handlebars and slide the assembly a little toward the end of the bars. With heated grips the wires can rub on the end of the bars inside the grip rubbers. Sliding them out a bit stops the rubbing and the sticky throttle action..
Tosi has done a lot of work on these ABS units and has good info on testing and clearing fault codes etc. I have found this info and we will use it tom. Morning to troubleshoot. Thanks for the other advise. This forum is filled with help. Love it! Slow/sticky throttle: Clean the grease out of the gears where the throttle grip turns the cam the pulls the chain for the throttle cable. Then spray it all down with spray silicone lubricant. 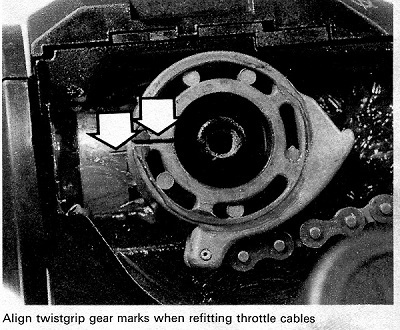 1) Some Ks have (and some don't) a thumbscrew on the underside of the throttle gear/chain assembly shown above. This applies friction, making a sort-of cruise control. Check for one, and of it's snugged down causing friction. 2) My throttle was sticking, then I realized the rubber grip had been pounded on the bars so hard it was mashed up against the switch housing. It was pressing just hard enough the return springs couldn't overcome it. I had checked all the linkage before seeing this and feeling stupid. Nice looking bike! 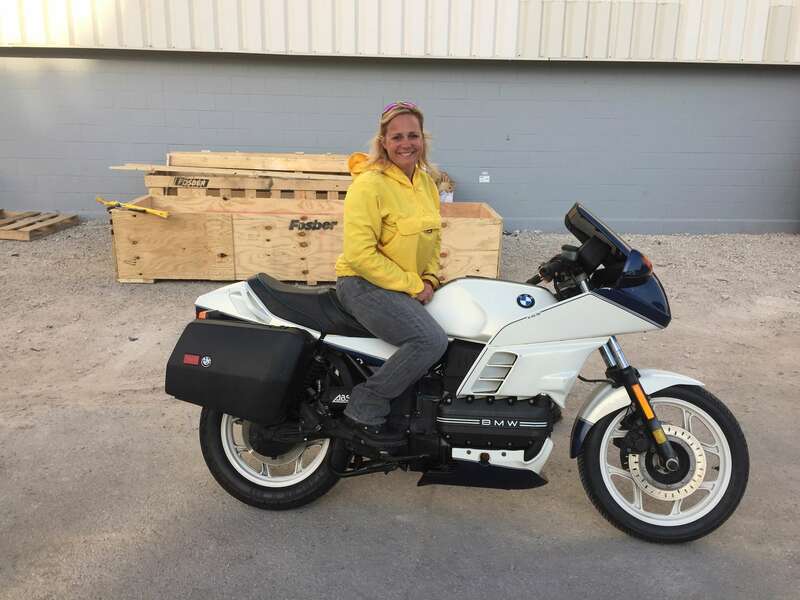 I like the K100RS anyway, and that's a nice color scheme and looks in great condition. If you have heated grips the wire comes up the middle of the bars and can bunch up right up near the grip and make it stiff. ride well and enjoy !!! My guess it that there will be a failure point in (2). It could be either the stoplight bulb itself (unlikely - you'd have seen it by now) or one of the brake switches isn't working. The problem with the switches is that they can easily corrode internally and jam the plunger in the off position. They're easy enough to see as both of them are right next to their respective levers. Try soaking them in penetrating oil. I actually don't like them and have replaced both of mine with hydraulic switches as I find that they are more reliable. 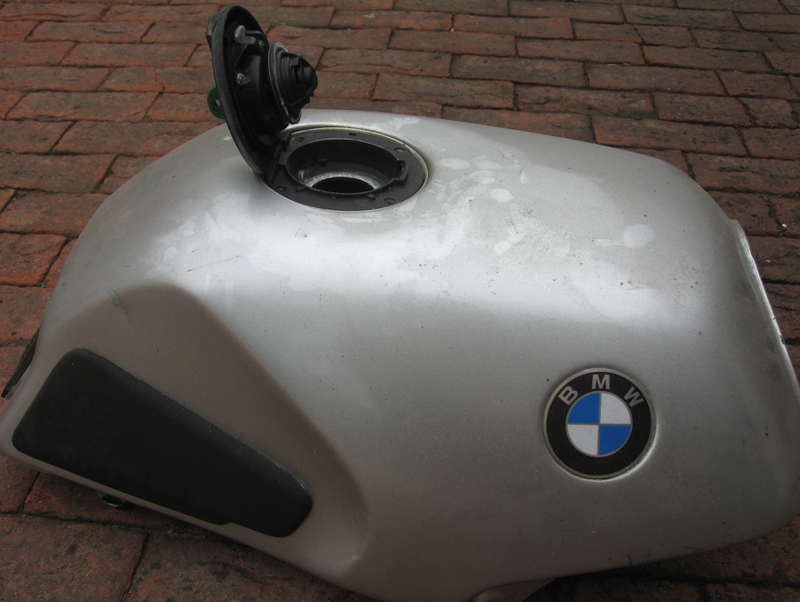 If it turns out to be the BMU, they turn up cheaply enough on ebay. Someone here may have a spare that they're wiiling to part with too. The latter brake switches were microswitch type and not the earlier plunger type. the microswitch type are more reliable. Also, if you earlier removed the right foot peg plate, make sure that you didn't pinch the brake wires between the plate and frame when reattaching. Congratulations on a well running beautiful bike. It's not extremely common but sometimes an old tail or brake light bulb, even though it illuminates, can make the BMU unhappy. And it never hurts to pull both bulbs to make sure that the contacts on the base aren't corroded. Nice photo, right side up! The bike is lovely and that warm smile says a lot! @robmack wrote: The latter brake switches were microswitch type and not the earlier plunger type. Only rear switch, on the 2V models (as this is). Yeah - nice pic and great result. Careful - you could end up on the K100 annual calendar (perhaps with a more exotic background?)!! OK so the first ride didn't go without a hitch, but you found the problem, fixed it and rode again...that's what these bikes are all about! Tail Light/Brake Light/Front & Rear brake switches: If you've got the red triangle light in the centre of instrument cluster giving a steady light which doesn't start flashing in time with the ABS light when you operate both the front and rear brakes then you have a problem with a blown bulb, poor electrical connection between bulb and holder, a wiring problem or one of the brake switches is not working. The ABS system will not activate until it has detected that both front and rear brakes have been operated, so is likely to keep flashing until you press the ABS switch which then gives a steady red light (for the next 10 minutes). Easy to check: Switch on lights - does the red tail light illuminate? If not, this could be your fault, so check the bulb. If it does illuminate - apply front brake...does brake light illuminate? If yes - bulb, front switch and that part of wiring all good. Apply rear brake - does brake light illuminate? If yes - rear brake switch, bulb and that part of wiring all good. If neither front nor rear brake application illuminates the brake light then remove tail light cluster and check/replace bulb (access retaining nuts from inside ducktail - easiest if your get ABS brain out of the way first). If bulb is good, check/clean bulb connectors and try test again. If either the front or the rear brake application illuminates the brake light (but not both) then it is likely that the switch in either the front or the rear switch needs a clean. The rear brake switch is in a grotty low down place and can cause problems, especially when the bike has not been used much. 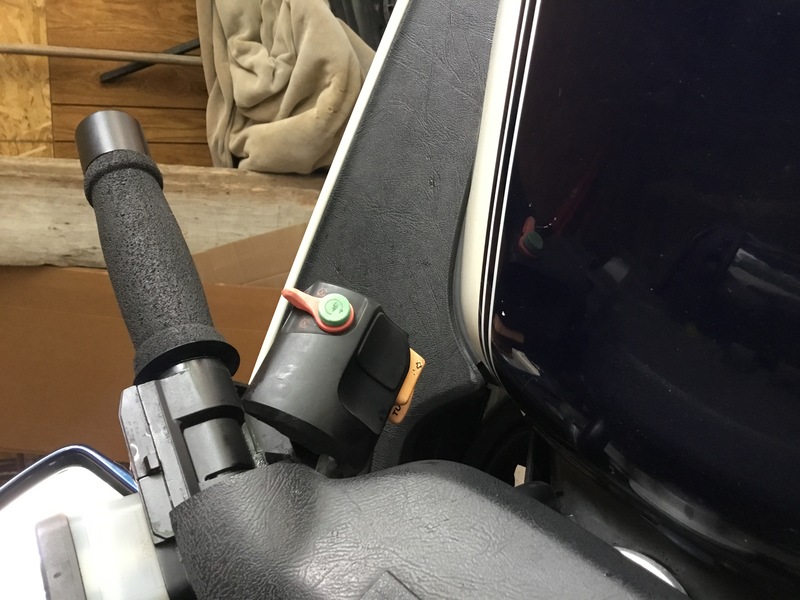 It is easy enough to access by unbolting the right hand foot rest mount (no need to disconnect any brake hoses, but you may need to unbolt the ABS modulator from the foot rest (if it is the same as a LT). The front one is attached to the front brake lever mechanism and fairly easy to get at. ABS Fault: If the tail & brake light is working as it should, when you operate the front and rear brakes, the red triangle light starts flashing in time with the ABS light. As soon as the bike moves faster than 2.5mph, the ABS system should activate and both ABS and red triangle light should extinguish. If they keep flashing, then that points to an ABS error/fault. Basically the ABS seem is monitoring the speed of both the front and rear wheels - if there is a problem with one of the sensors, then the ABS brain will throw up and error and won't activate until the error has been cleared (i.e. fault found and rectified and error cleared). Several posts on the forum about reading the error code and clearing the brain. Sticky throttle - as per previous suggestions. You can also find that the bar end weight can have been pushed on a little too far and is rubbing against the end of the twist grip. So I posted a response and it seems to have Disappeared? Weird. Anyways I wanted to thank everyone for their responses and I’m going to try to take a look shortly . Dave’s working major overtime the next three days so I don’t have a ton of support to pester with stupid questions so I’m not sure how far I’ll get. The assumption was that she had stood for several years with old ethanol rich fuel in the tank - that usually rots all the rubber bits and turns them to gunge and also forms a hard varnish like deposit on the internals of the tank etc. 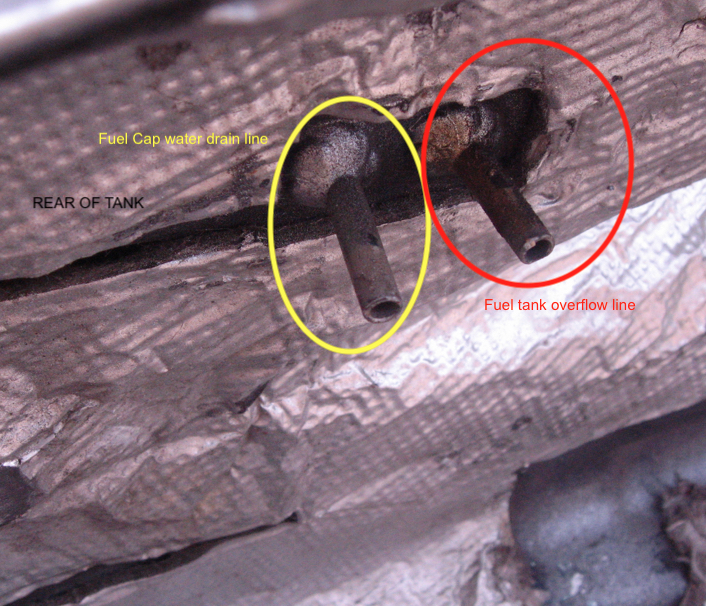 Your pictures showed a lot of corrosion (rust) though which is indicative of water getting into the tank. This can be through dodgy fuel suppliers but I think your problem was down to your fuel cap being back to front and letting rain water into the tank. 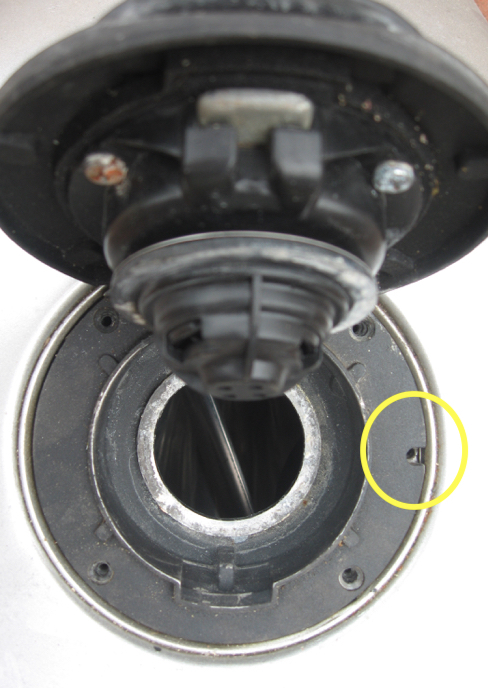 The fuel cap is supposed to go on so that the hinge is to the rear - yours looks like the hinge is to the front (i.e. opens towards the front of the bike). Side Car Paul is normally very good at spotting this common mistake. 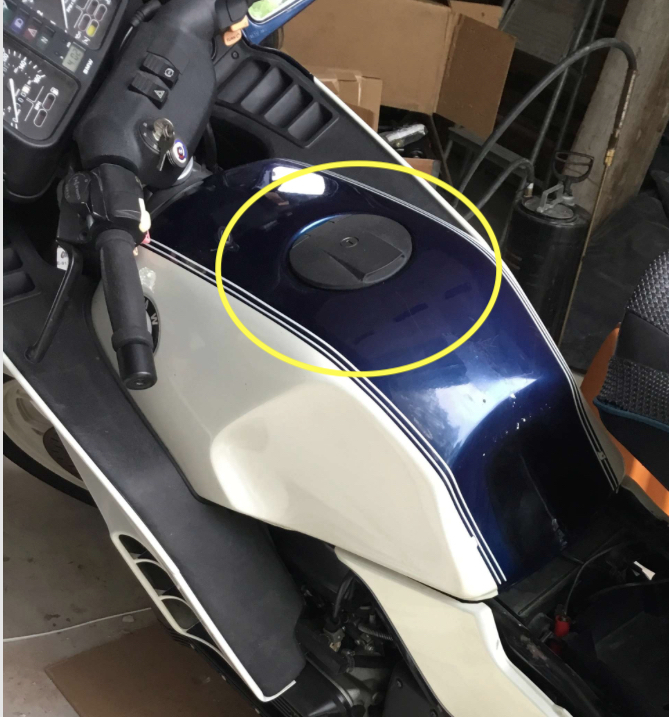 This first pic is from your post of 31 May (around about the time you got the bike) and clearly shows the cap back to front. The second pic is from your post ride pose...and it looks as if the raised part of the cap is still to the rear i.e. you have put it back on the wrong way around again - I suspect that you probably just put it back as it had been before). 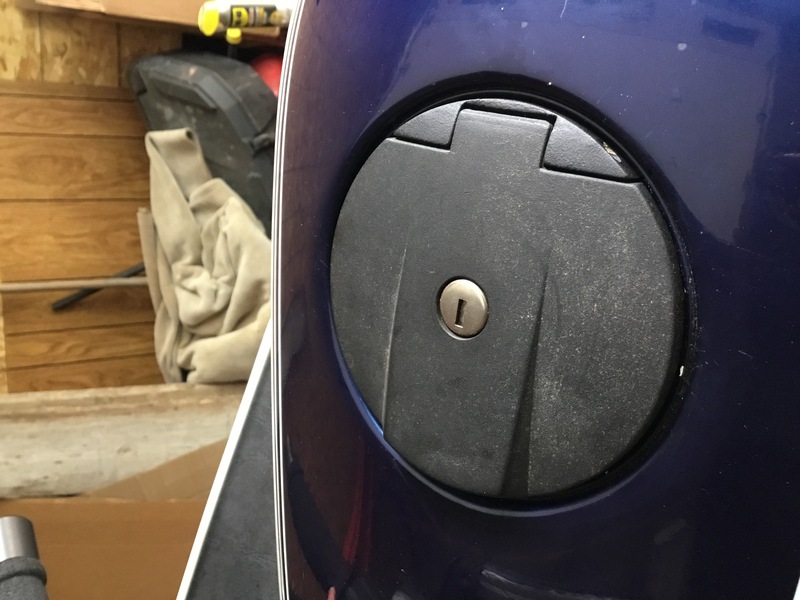 The reason why the fuel cap goes on the other way around (hinge to rear), is because there is a small drain hole to the left of the cap which allows rain water etc. that gathers around the cap to drain away through fixed pipe inside the tank and out through a spigot. 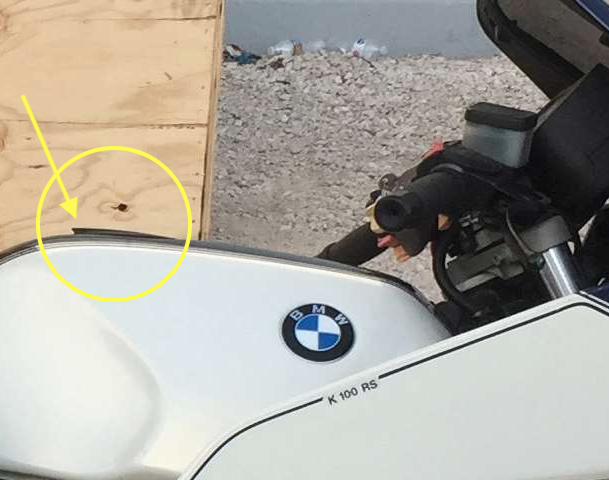 I guess the reason why the drain hole is to the left is to ensure that it is the low point when the bike is on the side stand. There is a second spigot immediately in front of the water drain one - that is the fuel tank overflow line (allows the tank to vent fuel if needed e.g. bike standing with full fuel tank on a hot day). 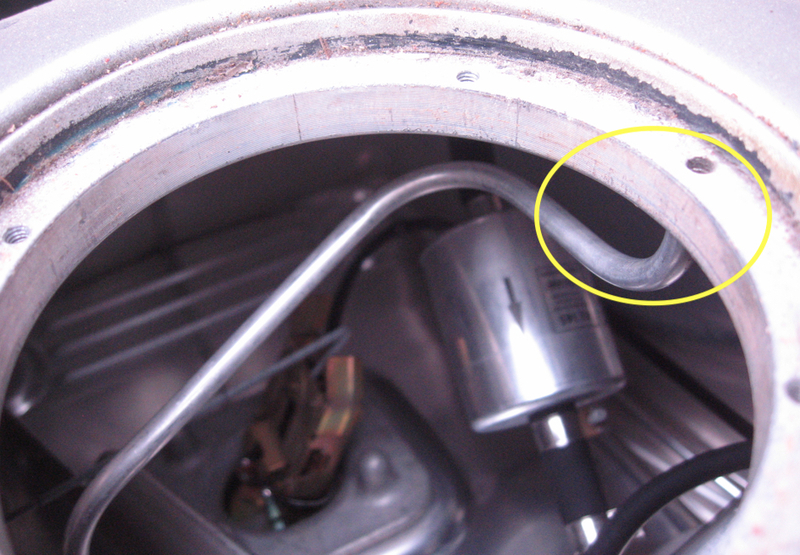 Both these spigots drain into a little catch pot tucked against the right of the frame which, in turn, drains out under the bike via a short length of rubber hose. 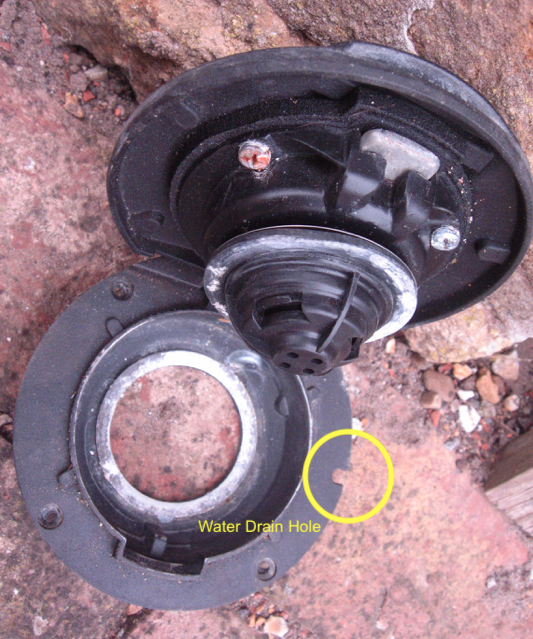 The filler cap and it's sealing rubber gasket both have a cut out which need to align with the drain hole - otherwise any water that gathers around the cap is likely to get into the tank - especially when opening it on rainy days. Hope this helps - hate to think that you went to all that effort of cleaning out the tank (and are going to put a replacement fuel level indicator in when you get one) for it to happen all over again. Thank you so much for the gas cap advice. It has been on wrong. We will be fixing that . Dave’s working on the throttle as we speak. He siad the grease was gunked up. It should be better shortly. Dave dropped the screw that holds on the throttle body. Anyone know what size it is? I know I saw somewhere a bolt size chart and it might be in the manual, but we have limited time and I want to run and get a new one seeing we can’t find it. The screw that holds the switch gear onto the perch? It's a tapered head 4x12mm with thread pitch of 70, same as the other side's switchgear. The throttle bodies are on the cylinder head, unless you're referring to the throttle twisty bit. @Two Wheels Better wrote: The screw that holds the switch gear onto the perch? It's a tapered head 4x12mm with thread pitch of 70, same as the other side's switchgear. The throttle bodies are on the cylinder head, unless you're referring to the throttle twisty bit. Sorry, I used the wrong part name. Thank you. That’s what we needed. Very very nice and appreciated. We have it on correct now! I’m so sad, there’s a vintage bike show 30 min. From us and Dave’s working. I wanted to report thanks to everyone’s help, we were able to get the abs lights off! We followed the troubleshooting guide and after we reset it, the lights went out. Yay! I started to remove the bolts to check the splines but after getting g the first two bolts out, it looked like there was fairly fresh antiseize on there which doesn’t mean it was serviced recently, but b, I didn’t have the lube needed to come,etc the job if needed so decided to wait. A common sign for clutch splines getting dry is getting false neutrals when downshifting. For some reason, this seems most obvious when shifting 4>3 or 3>2. If you start experiencing that then you'll want to move spline lubing to the top of your todo list. You're probably OK for now though so get out and put some miles on that puppy!